First of all I must thank everyone for the wonderful comments I received about my 'water' card from last week's Less is More challenge. They were truly appreciated. In fact I have a similar sort of card published in this month's Craft Stamper magazine, using a stamp of sea birds from the same company as the one I used last week. As we have to submit cards about three months in advance of publication, I had sort of forgotten about it! Anyway the theme at Less is More this week is Hello Sunshine! I've seen quite a bit of it on my holiday during the last couple of weeks... on a river cruise along the Danube. I had a wonderful time and met some super people. Here is my card for this week's challenge! I'm afraid there's only one this week, as I only got back yesterday and I'm up to my eyes in laundry! Here is a simple die cut card, using dies from Lawn Fawn and Taylored Expressions. The sentiment is computer generated in KBA Stitch in Time. Sadly at this size the stitching doesn't really show up, but the idea was to match the font with the die cuts! I have a few commissions to get on with so I shall be busy over the next few days, however I do hope to be back to commenting on submissions to the challenges this week! 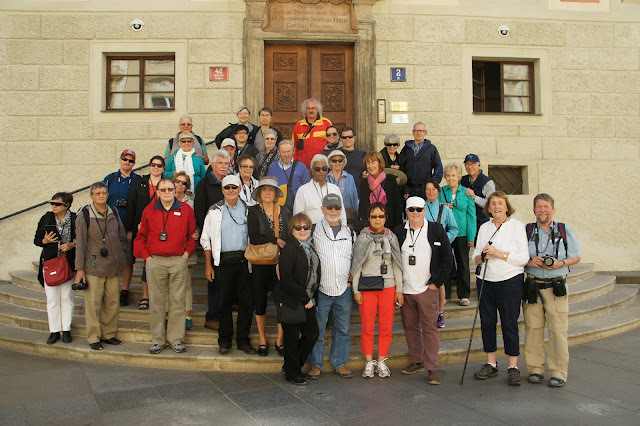 Here is a pic of some of the members of the group on a trip around Prague Castle...can you spot me? Teal sweatshirt, white scarf? I can thoroughly recommend this holiday! This is a quick card made with SU Kinda Eclectic set, plus a sentiment made in Word with Bohemian typewriter and CK_Alis_Hand fonts. The inks are Ranger Lemon Twist dye ink and Mustard Seed Distress ink. Wow! Simply fantastic cards Chrissie! So crisp CAS cheery and beautiful! Not lost your touch with a few weeks away that's for sure! I wish I knew how to make sentiments in Word like that! Very cool. I'm new to your blog - just subscribed the other day. Pretty cards, today! Nice to have you back Chrissy but even better to read you have enjoyed your holliday. I'm on a countdown for mine aswell ;-) June 5th we go to France. Charming little card, Chrissie. That's quite a cruise group. Glad you had such a great time. O, what a wonderful cards! I love sunshine. And who does not! :-)) I'm glad that you have had superb holiday. It is always fun exploring new countries. Sound as if you had a lovely holiday, Chrissie!!! Your cards are both lovely!!! 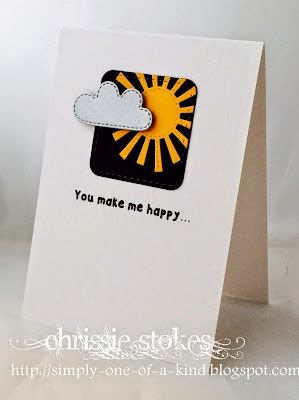 Love the fun sun and cloud on the first with the cute sentiment!!! The butterflies on the second one are stunning!!! Love the pearl accents, the sun and the lovely sentiment to go with it!!! Lovely CAS creations!!! we went to Prague a few years ago and loved it. One of the best city breaks we ever went on, such a beautiful city. Sound like a lovely holiday Chrissie - welcome back! 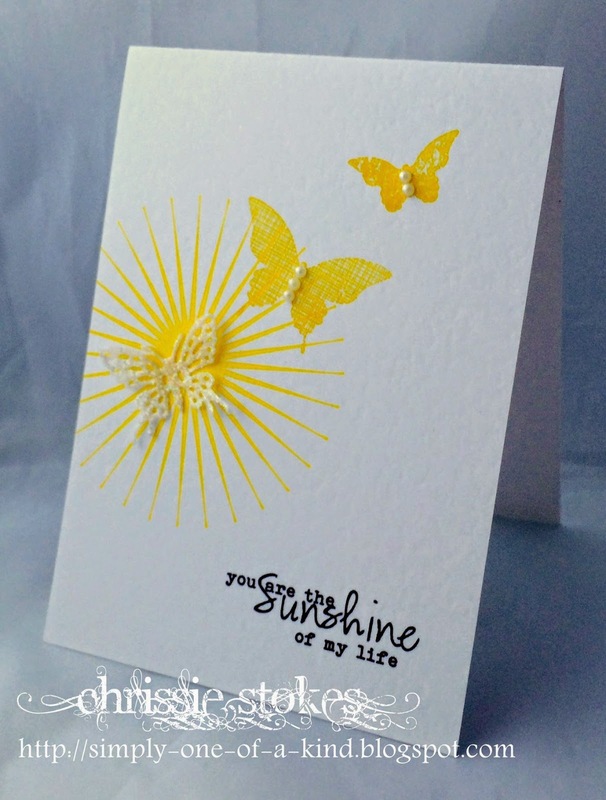 Love both your cards this week, perfect CAS - thanks for bringing back a little holiday sunshine with you!